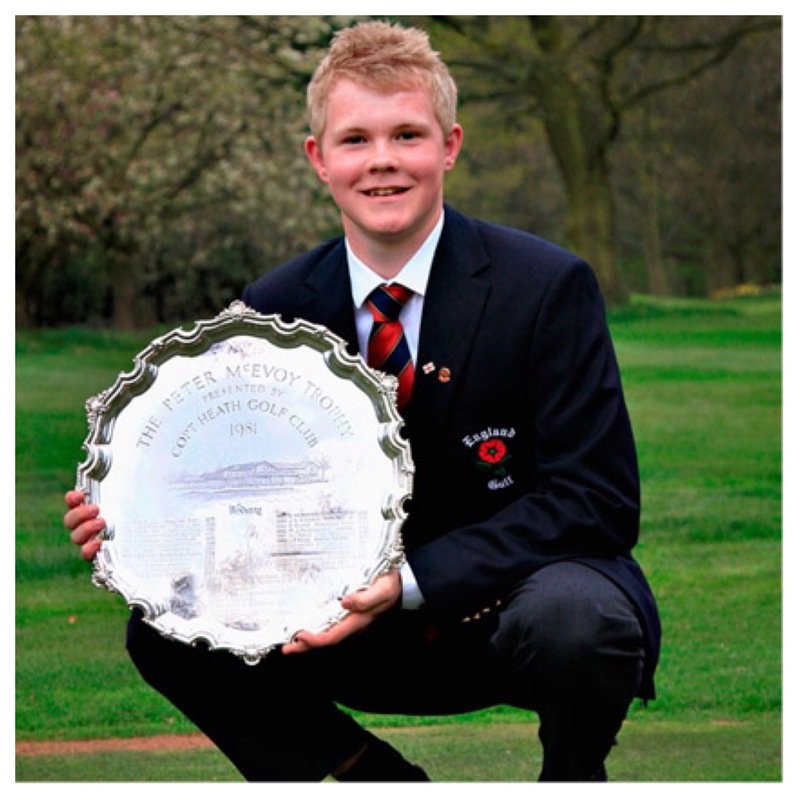 Nick POPPLETON (ENG) today won the 2018 Brabazon Trophy after a sudden death play-off with Wilco NIENABER (RSA). Both players had started the day on 6-under, 3 shots back of overnight leader Jeong Weon KO (FRA). Nick shot two rounds of 67 on the final day recording just two bogeys while Wilco posted a 65 and 69. Both players posting an impressive aggregate score of -10 for their final two rounds, played in glorious sunshine on Frilford Heath’s Red Course. The play-off took place on the 9th hole of Frilford’s Red Course. The 9th is a 180 yard par 3 played over a valley to an elevated green that slopes from back to front and is protected by two short bunkers. The flag was in the front right portion of the green. Nick teed off first and finished short right in front of the bunker. Wilco followed him and finished in roughly the same area, a little closer to the bunker. Nick chipped up and watched in anguish as his well judged shot hit the flag and stayed out. Wilco followed and saw his chip finish an inch to the right of the hole. Both tapped-in quickly and returned to the tee to try again. Despite now playing the hole for the fourth time on the day both players again missed the green short right. Nick was further away, perhaps as much as 30 feet. This time his chip ran up perfectly and dropped into the hole beside the flag. A magnificent shot played under the most extreme pressure. Wilco then chipped up from just in front of the green and amazingly lipped out, the ball finishing stone dead. The gallery had seen four difficult chips to a raised green and from reasonable distance in the play-off; three hit the hole and one stayed on the lip. It was some exhibition of the skills these elite amateurs have. 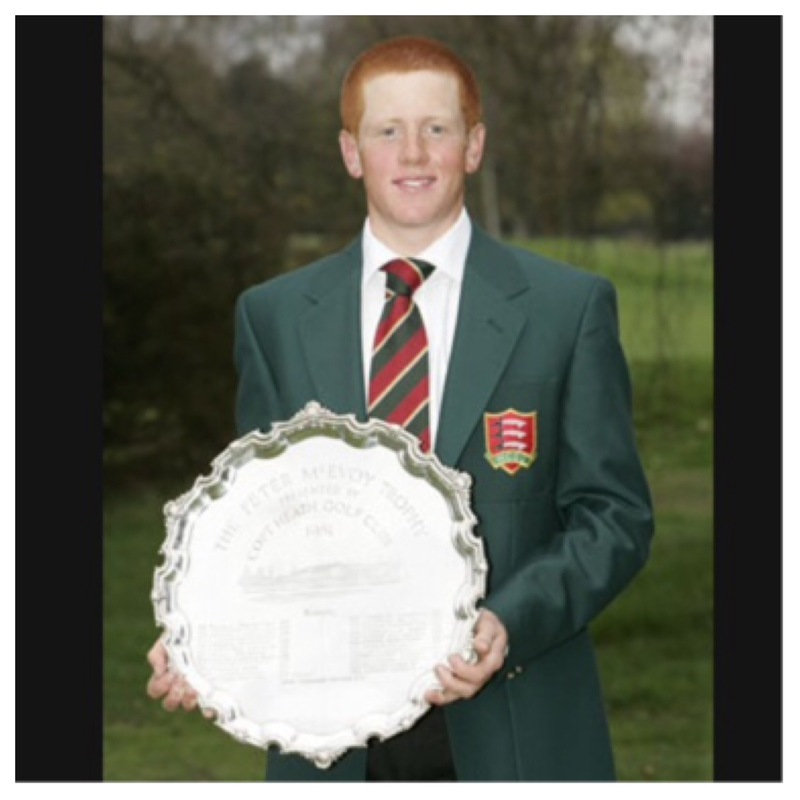 Nick had won the 2018 Brabazon Trophy in some style on the second extra hole. It was a great win for the likeable Yorkshireman. Wilco should be disappointed he lost. This was my first viewing of him and he certainly looked the part, a professional in all but name. He hits the ball miles, has a beautiful short game and his temperament was first class. He clearly has a big future in the game, a prediction I wouldn’t normally make but feel confident of doing so with him. I am sure he will learn from this loss. I set off with the Wilco NIENABER and Jack COPE pairing this afternoon, keeping a close eye on Nick POPPLETON who was playing ahead of them with David LANGLEY. Not for the first time this season I would end up watching a relatively comfortable leader grasp defeat from the jaws of victory. Wilco seemed very relaxed and despite leaking most of his tee shots to the right took advantage of his power and beautiful short game. He seemed to escape with pars or earn birdies on most of the holes on the front nine. The exception being the downhill 500 yard 6th where he eagled after a long drive and iron shot to 10 feet. When he followed it with a birdie on the 7th he was 5-under for his final round and -18 for the Championship, leading Nick by 4 shots. Jack was playing very well but simply couldn’t get anything to drop on the greens on the front nine. Up ahead Nick was continuing his good form and was 3-under on the front nine for his own round. Wilco was a bit lose around the turn dropping shots on 8 and 11 but doing well to get one back on the 12th where his towering approach from the deepish rough was judged perfectly. After a solid par on the strategic right-to-left dogleg 13th, where he hit an iron off the tee and a nice approach to the difficult back pin position, the South African Number 1 was -4 for the round and -17 for the event. He was leading Nick by 3 shots. As the small gallery walked up the 354 yard par 4 – what appeared to be the tightest, most penal hole on the course – we discussed how Wilco would surely play an iron. Jack, who had birdied the 12th and was therefore playing first, did just that and found the centre of the fairway, leaving himself a wedge in. This was the point at which the Championship was undoubtedly lost. Wilco, who was confidently being advised and caddied for throughout by a Golf RSA coach / manager, proceeded to smash his drive well into the gorse, again long right. This was not a surprise; he had done the same thing on most of the proceeding holes, the difference being they had all been much wider, allowing short ‘recovery’ shots to be played to the green. Aggressive play is great and clearly Wilco’s preferred approach but certain situations – e.g. when you have a 3 shot lead with 5 holes to play and are facing a hole bordered by gorse on both sides – require a bit more subtlety and the removal of big numbers from the potential equation. If I had been caddying for him neither his woods, or for that matter his long irons, would have gone within 100 yards of the tee box. After all this is a lad that probably hits his 7-iron 200 yards. Surprisingly he hit his provisional with his driver too. To be fair this time he came up 20 yards short of the green. His chip was poor by the high standards of earlier in his round and before he knew it he was writing down 6 on his scorecard. He may not of known it at the time but his lead was now just 1 shot. On the 421 yard 15th Wilco smashed his ball to within 30 yards of the green. Even allowing for the perfect playing conditions this was a massive hit. However, he couldn’t get up and down for birdie. Playing from the semi-rough he misjudged the lack of spin he would be able to generate and ran well past the hole. As he putted out Nick was waiting on the nearby 16th with his caddie, friend and professional Alex Stubbs. This was the point where the Championship was won. England Golf had pushed the tee up for the final round and as such the hole was playing as a drivable 295 yard par 4. Nick hit a superb drive that found a path up the narrow right side of the green to a pin perched on the right ledge. When he holed the 15 foot putt for eagle he led by 1 shot. With the green clear Jack found the putting surface whilst Wilco bounced into the left hand bunker. Jack proceeded to three putt for par whilst Wilco played a superb long bunker shot to a few feet but to everyone’s surprise missed his short birdie putt. I quickly scampered after the Yorkshireman who by this time was finishing off on the 17th. Nick held his nerve to par in. He did give himself a 20 footer on the last for the outright win but the putt lipped out. Wilco missed a relatively short downhill putt on 17 to draw back level. Hitting driver – perfectly justifiable given he was now chasing – on the 324 yard par 4 18th he flirted with the members car park before coming up just short of pin high on the left hand side. His chip was well played but ran out four feet passed the hole which was on the right edge of the green. To his credit he bravely slotted the downhill right to lefter for birdie, thus gaining a chance for redemption in a play-off. With four groups still to come in it took almost an hour before the play-off could commence. As can be seen from the above screenshot England’s Bailey GILL and Jack COPE (-13 / tied 3rd), Andrew WILSON (-11 / tied 6th), Mitch WAITE (-11 / tied 6th), Arun SINGH BRAR (-9 / 8th), Max MARTIN, David LANGLEY and Ben JONES (-8 / all tied 9th) all enjoyed Top 10 finishes. Jack COPE (ENG) seemed to gain confidence from Wilco’s back nine difficulties coming home in 33 with four birdies and one bogey. 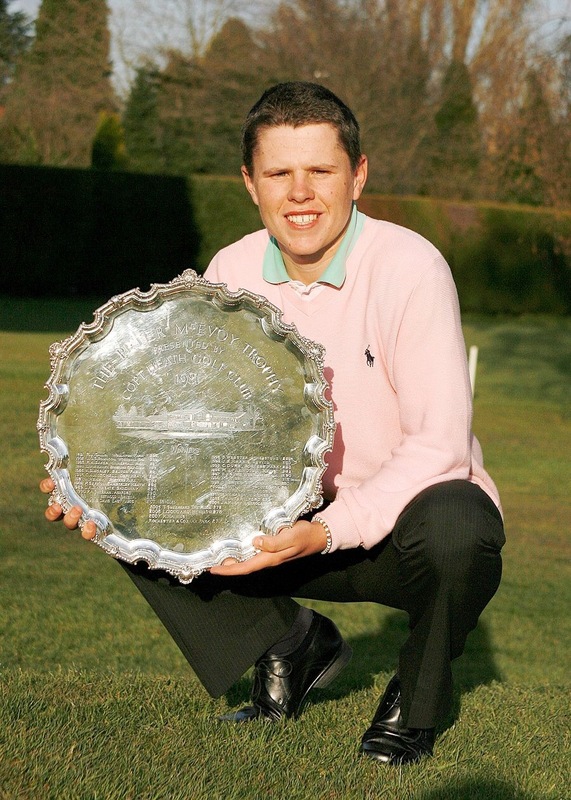 His -13 total and tied 3rd finish helped him win The George Henriques Salver, a prize awarded to the leading GB&I player in the Championship under the age of 20. Arun SINGH BRAR (-9) finished second in these supplementary standings. Play commenced at 7.30am with the leaders, Messrs. Ko and Waite, heading off at 9.09am. Unfortunately they recorded a 73 and 72 respectively from which they were unable to recover in the afternoon despite posting much improved rounds of 68 and 69. However, the two main stories from Round 3 concerned South African protege Wilco NIENABER (RSA) and Darlington’s Andrew WILSON. Wilco started on the 10th being one of the leading players. His halves of 33 and 32 included six birdies and one eagle. His -13 total after 54 holes gave him a 2 shot lead over Nick POPPLETON who had also impressed with his own 6 birdie 67 to move into second on -11. Andrew started on the 1st at 8.15am and shot a sparkling best of the tournament course record 63 which he told me could have been better; a bogey on three and with four birdie opportunities all passed up over the closing holes. He was now right in the mix but would need to go low again in the afternoon. Jeong Weon KO (FRA) leads Mitch WAITE (ENG) by 1 shot at the end of Round 2. Ko shot a 69 to move onto -9 whilst Waite posted a joint best of the day 67 (-5), including 7 birdies, to move on to -8. Charlie STRICKLAND (ENG), whose season has been interrupted with health issues, is pleasingly in a three way tie for third on -7; he’s joined by Stuart EASTON (SCO) and Ferdinand MUELLER (GER). Thomas BEASLEY (ENG) was the other player to shoot 67 on Day 2. His bogey free round included 4 birdies in his last 6 holes. Thomas will start the final day on -2 and in tied 28th place. The cut fell at -1 with 46 players progressing. With 21 players within 5 shots of the lead Sunday’s 36 holes should provide an exciting race to the title. Round 1 was concluded by early afternoon with the scoring bar lowered even further. Jeong Weon KO (FRA), Nick POPPLETON (ENG) and Jay BEISSER (ENG) all posted 66’s (-6) on Day 2 to tie the Round 1 lead. Beisser birdied every par 3 and par 5 to hand in an unusual card made up solely of 2’s and 4’s. 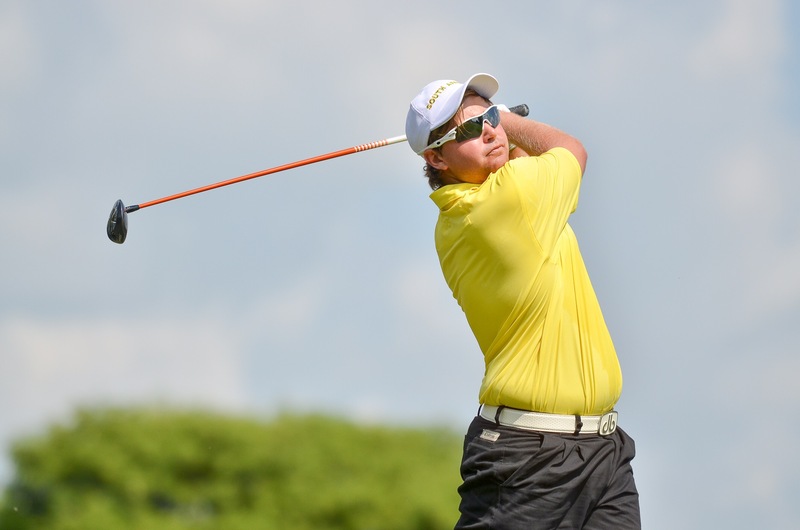 Frederic LACROIX (FRA) joined Wilco NIENABER (RSA), Jack COPE (ENG) and Ferdinand MUELLER (GER), yesterday’s clubhouse leaders, by recording a 67 (-5). The four of them are all tied for fourth at this early stage. Round 1 scoring has been good with 42 players under par from the 155 who started the event. England Golf have announced that the 36 hole cut will now be set at the top 45 and ties, rather than the normal top 60 and ties; the higher level having also been reaffirmed yesterday after the suspension in play. With 59 players tied 45th or better and 78 players at tied 60th or better after Round 1, and with only another 18 holes to be played before the cut is made, I assume a fear of having too big a field for the final 36 holes on Sunday has driven this decision. After disappointing first rounds Matt SAULEZ (RSA) 74 +2, Chris WOOLLAM (RSA) 74 +2, Sam LOCKE 75 (SCO) +3, Andrew WILSON (ENG) 75 +3, Lewis GEORGE (ENG) 76 +4 and Robin WILLIAMS (ENG) 77 +5 are amongst the more notable players that will require a strong bounce back tomorrow to make the final day. Play started at 8.00am but was brought to a premature close around 3.00pm by thunderstorms which left the Frilford Heath course flooded. 74 players managed to complete their first rounds before play was abandoned. The leaders in the clubhouse being Wilco NIENABER (RSA), Jack COPE (ENG) and Ferdinand MUELLER (GER) who all shot 67’s (-5). Sadly Todd CLEMENTS (ENG), one of the highest ranked competitors, had to withdraw before his 9.05am tee time with a back injury. In an event already lacking some of the field depth seen in previous years this was a blow from a ranking perspective. England Golf have now decided to complete Round 1 tomorrow before playing Round 2 on Saturday. The Top 60 and Ties cut will still take place after 36 holes meaning the leading players will now have to play 36 holes on Sunday. The English Men’s Open Amateur Stroke Play Championship for the Brabazon Trophy will be played at Frilford Heath Golf Club this week. The 72nd playing of this event takes place between Thursday 31st and Sunday 3rd June on the Oxfordshire Club’s Red Course. 156 competitors will start the 2018 Championship. Whilst England dominates the entries players from 12 other countries are also represented. 78 players were exempted into the field based on their previous accomplishments with 78 coming through a qualifying process. 13 of the 20 recently announced Great Britain & Ireland (GB&I) St. Andrews Trophy Squad will be competing at the Brabazon. These are Todd CLEMENTS (ENG), Alex FITZPATRICK (ENG), Calum FYFE (SCO), David HAGUE (ENG), Ben JONES (ENG), Matthew JORDAN (ENG), Sam LOCKE (SCO), Billy MCKENZIE (ENG), Gian-Marco PETROZZI (ENG), Jamie STEWART (SCO), Euan WALKER (SCO), Robin WILLIAMS (ENG) and Andrew WILSON (ENG). Of those missing the event Harry HALL (ENG), Ryan LUMSDEN (SCO) and Sandy SCOTT (SCO) were unable to enter due to the conflicting NCAA Division I National Championships which is currently being played in Oklahoma. 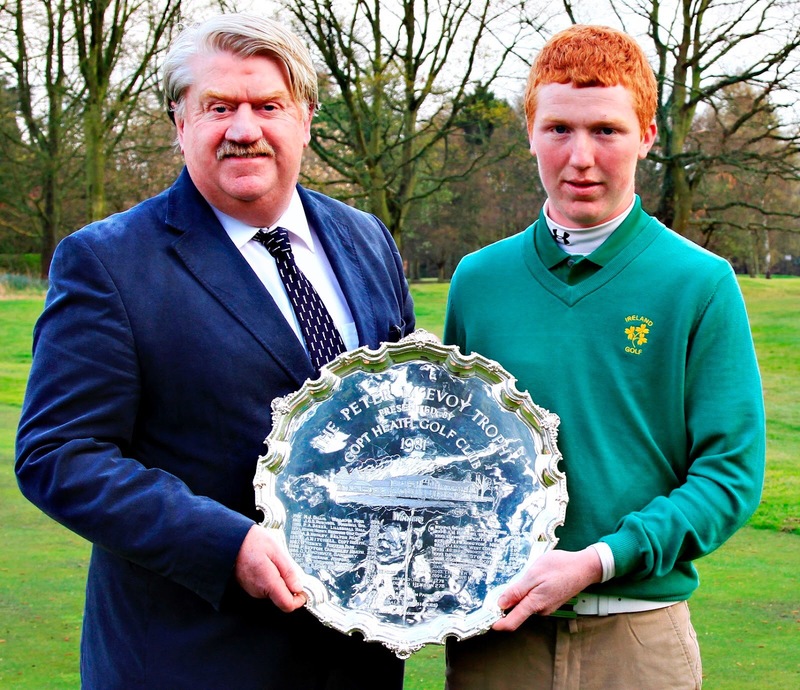 Rowan LESTER (IRE) and Caolan RAFFERTY (IRE) are playing in the East of Ireland Amateur Championship. The two leading Irish players Robin DAWSON (IRE) and Alex GLEESON (IRE) appear to be taking the week off. To put the event in context the 2017 Brabazon was ranked the 17th most important amateur competition in the world last year based on the strength of it’s field by the Scratch Players World Amateur Ranking (SPWAR). Unfortunately a scheduling clash with the East of Ireland Championship means a much lower event ranking can be expected in 2018. The Winner receives the magnificent gold Brabazon Trophy shown in the photo below. 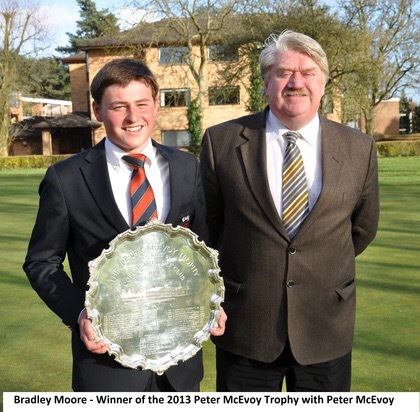 Two other prizes are connected to the Brabazon Trophy competition. 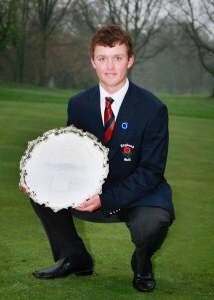 The George Henriques Salver is awarded to the leading GB&I player in the Championship under the age of 20. 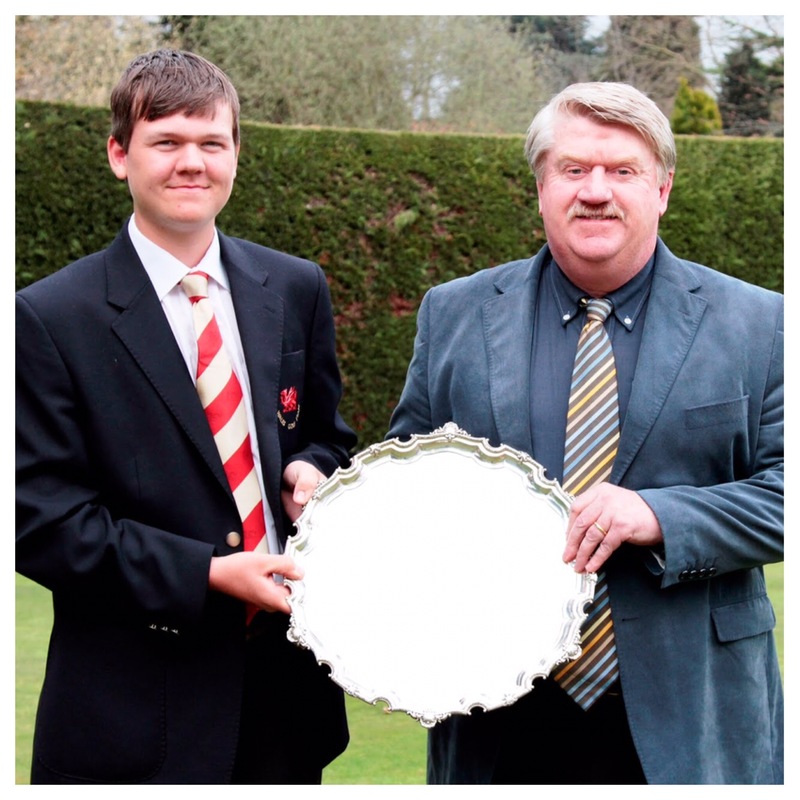 The Philip Scruton Jug is awarded later in the year to the player returning the best aggregate scores in The Brabazon Trophy and The Berkshire Trophy (which will be played on 23rd and 24th June). Frilford’s first course, the Red, was designed by J.H. Taylor, the five times Open Champion, in 1908 and opened in the following year. Club professional J.H. Turner undertook some later tweaks but it largely remains as originally planned. This predominantly heathland course measures around 7,000 yards depending on which tees are selected. A par of 72 is split 36-36, albeit as you can see from the scorecard below the hole configurations are different on the two nines. The weather forecast (as at Wednesday 30th May) is broadly positive for all four competition days, albeit the modest winds are expected to move around from day to day. Thu 25th May – Thundery Showers / Wind 8 mph E / Temp. Min. 15°C, Max. 21°C. Fri 26th May – Light Rain / Wind 11 mph SW / Temp. Min. 13°C, Max. 21°C. Sat 27th May – Sunny / Wind 9 mph W / Temp. Min. 10°C / Min 21°C. Sun 28th May – Cloudy / Wind 8 mph NE / Temp. Min. 13°C / Max. 23°C. It is worth remembering that Rounds 1 and 2 will see players tee off the 1st from 8.00am right through until 2.35pm. South Africa’s Kyle MCCLATCHIE celebrated his 20th birthday by winning the 2017 English Men’s Open Amateur Stroke Play Championship at Woodhall Spa Golf Club. Kyle shot rounds of 70, 66, 75 and 71 for a 282 (-10) total and a 1-shot victory. 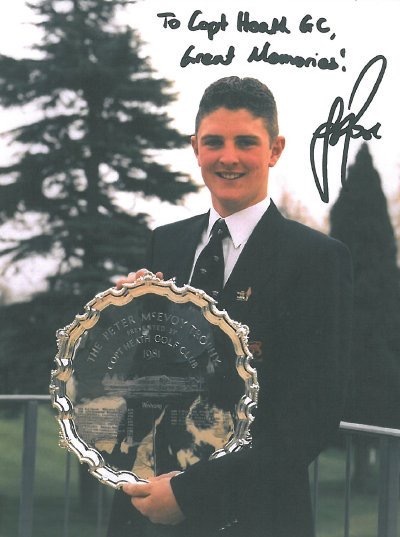 He was the fifth South African to win the Brabazon Trophy, following in the footsteps of Neville Sundelson (1974), Richard Kaplan (1986), Craig Rivett (1989T) and Charl Schwartzel (2002). Jamie Stewart had a superb weekend shooting the lowest two scores on both days. He followed a 67 (-6) with a 68 (-5) in the final round. Matthew JORDAN (ENG) (-7) finished 5th, Dan BROWN (ENG) (-5) 6th and David BOOTE (WAL) (-4) 7th. Other notable European winners include well known pros Ignacio GARRIDO (1992) and Peter HANSON (1998).